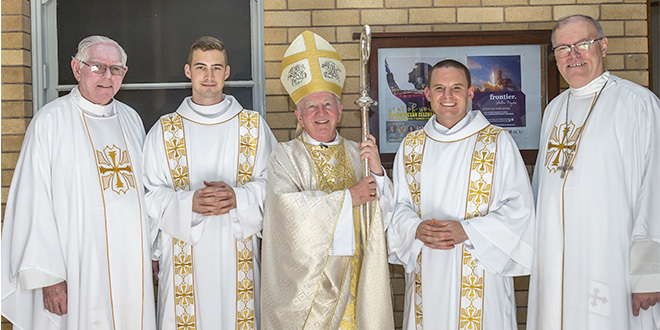 DEACONS Joshua Whitehead and Thomas Duncan took a major step towards ministerial priesthood last Friday when they were ordained as deacons at the Holy Spirit Chapel, Banyo. 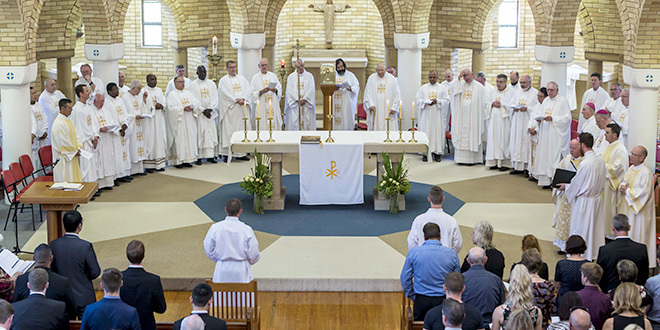 Toowoomba Bishop Robert McGuckin celebrated the Mass with more than 100 clergy and faithful present. “As deacons, Thomas and Joshua will be strengthened by the gift of the Holy Spirit, they will help the bishop and priests in the ministry of the Word, of the altar, and of charity, showing themselves to be servants of all,” Bishop McGuckin said. Deacon Whitehead, who was supported by family and friends from his native country of New Zealand, said his heart was “so full of joy”. “I’m just ear-to-ear at the moment with my grin,” he said. Deacon Whitehead, who will be appointed to St Stephen’s Cathedral parish as deacon for the term of his temporary diaconate on the road to priesthood, praised his time at the seminary. “This has been a journey that has been much longer than six years in the seminary, but without the journey in the seminary it wouldn’t have happened,” he said. “I’m just so grateful to the seminary formation staff and the students that I’ve journeyed with over these last six years. Deacon Duncan said the Rite of Ordination to Diaconate was of paramount importance. Submitting to serve: Thomas Duncan and Joshua Whitehead at Holy Spirit Chapel, Banyo, as they commit themselves to serve the Church in ministry. “This, for me, is the big day,” he said. “A lot of people don’t know what a deacon is. “They often see the priestly ordination as the big day but, for me, this is the big day, because this is when we commit our lives to God. 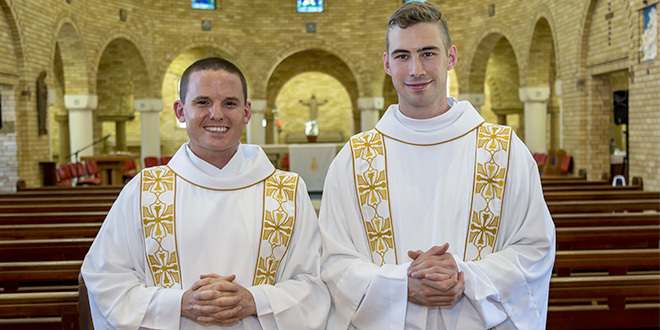 Deacon Duncan, who is preparing for the priesthood for the Toowoomba diocese where he will serve as deacon and university chaplain, had a prayerful grasp of what is required to be a good priest. “(A priest is) someone who is like Christ, who is close to him, who cares for Christ’s people,” he said. During his homily, Bishop McGuckin spoke about the gravity of self-sacrifice and answering the call to serve God. “This demands a very generous response – to be open to what is asked of them – to be open to where the spirit leads us,” he said. “Pope Francis has said if you want to make God laugh tell Him your plans. “Diaconate is a call to service, not one of our plans or wants. 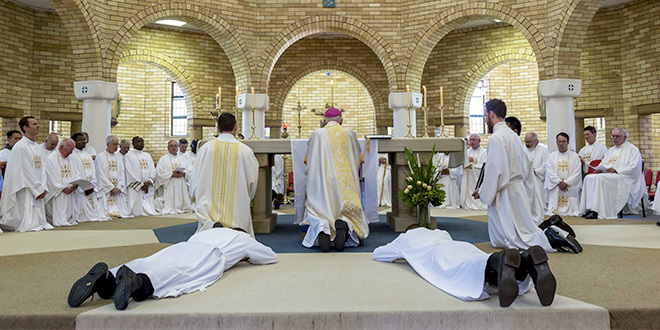 United in prayer: Toowoomba Bishop Robert McGuckin kneels in front of the altar and leads priests and the congregation in prayer for Joshua Whitehead and Thomas Duncan as they lay prostrate at the Mass in Holy Spirit Chapel for their ordination to the diaconate. “With the help of God, (the deacons) are to go about these duties in such a way that you will recognise them as disciples of Jesus who came not to be served, but to serve. “Joshua and Thomas, never allow yourselves to be turned away from the hope offered by the Gospel. “Now you are not only hearers of the Gospel but you are also its ministers. “Being a deacon is at the same time a privilege and a challenge – a challenge continually calling for self-sacrifice. “May we pray for Tom and Josh as they take this important step today. “I extend my thanks to Monsignor (John) Grace and the staff of Holy Spirit Seminary and to all who have been involved in Thomas’ and Joshua’s formation. “Joshua and Thomas, you are to be raised to the Order of the Diaconate. “The Lord has set an example that, just as he himself has done, you also should do. Faith: Monsignor John Grace, Deacon Thomas Duncan, Bishop Robert McGuckin, Deacon Josh Whitehead and Bishop Ken Howell after the ordination Mass.